What do you do with a Christmas tree after Christmas is over? Have you considered eating it? Well not the trunk (although the inner bark can be used medicinally), but the needles. Fir or spruce tips and pine needles can make a fine tea- infused a short period of time (don’t boil it.) But there is a world of uses beyond teas. Pine needles are high in Vitamin C, Vitamin A, quercetin, flavonoids, anthocyanins, tannins, pine oils, resveratrol, pinosylvin, shikimic acid, and isocupressic acid. Vitamin C levels may be as high as 5 times as that of lemons, depending on the species. The flavonoids, Vitamin C and associated compounds, and proanthocyanin are considered protective against cancer and scurvy. They are also are good for respiratory infections. Russian studies show pine oils as useful for weight control, lowered cholesterol and lowering blood pressure while Chinese studies find them as slowing the growth of liver cancer. Pinosylvin is antifungal and antimicrobial. Proanthocyanin and resveratrol are potent antiaging compounds. Isocupressic acid blocks progesterone in ruminants like cows and is considered toxic and abortafacient to them after the fermentation in their second stomach. This should not be a concern for humans due to our single stomach digestion, but of course has not been studied. The less tasty, more resinous pines like Ponderosa or Lodgepole pine have the highest levels. I think that if you let your taste be your guide, you will not overdose- pregnant women are quick to feel nauseated by harmful foods. Parsley can be abortafacient too, but pregnant women eat it in normal amounts without problem. But you are forewarned that it has not been tested as safe for pregnancy. The Vitamin C will extract into water but is not destroyed by boiling as is popularly believed. Vitamin C boils at over 500 degrees centigrade (water boils at 100 degrees centigrade and you can’t get to 500c with a normal stove) In most cases you are drinking the water. Just be careful that trees are not sprayed with fire retardants or infused with coloring. I don’t see it too much in my area, but I have been told it is more prevalent elsewhere. A tree farm owner says it is probably on trees imported from Canada but in New York is not required on local trees. While the fire retardant is supposed to be safe to ingest, I wouldn’t. If you have any doubts use young Spring tips of growing trees. This is the easiest way to use your tree. I always saved the needles that dropped off my tree especially after taking it outside. You can dry the needles of most Christmas trees to use this way. Just avoid trees that have been treated, flocked or sprayed. Dry the needles to use like rosemary in cooking. The flavor is resinous, lemony and good. You can also rub the needles into chicken, game or fish or most anything else. This is also good for tea- infuse a teaspoon or two of dry needles into a cup of boiling water. Take a few cups of dried needles and powder in a blender. This makes a light, somewhat lemony aromatic powder which is good on fish, chicken, sweet desserts or muffins. Cut the final tips off of a fresh tree into four inch sections (perhaps as you are pruning your tree into shape initially or if you can take the clippings from your tree vendor.) Freeze until you are ready to use so they do not dry out. You can bake or steam fish or poultry over them, stick a sprig into boiling spinach during the last few minutes or drp into your butternut squash soup. Fill a jar with dried fir tips, spruce tips or pine needles. Pour in vodka or gin to the top and let infuse for a month, then strain and bottle. I keep some of this by my stove and in my herbal apothecary for coughs and flu. When cooking, I throw a little on meat or vegetables. The alcohol burns off pretty instantly which helps the taste of the food all by itself, but it also leaves the taste of the evergreens. People who are into cocktails use a more dilute form of this. If you wish to pursue it, there are recipes in the linked articles below. 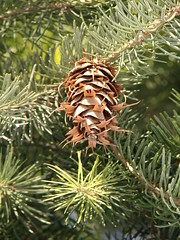 Simmer a 6″sprig of Scotch or White pine or fir in a cup of water for 10 minutes. Strain out and cool. Add 1 cup honey and a teaspoon of brandy. Put into an ice cream and freeze and crank according to the directions for your ice cream maker. Alternatively you can freeze into an ice cube tray and then pulse in a strong blender or Vitamix until smooth. Melt a pound of butter in a double boiler. Add 1/4 cup of spruce or fir tips or white pine cut into pieces. Infuse for a quarter hour, then strain and let solidify in a serving state. Fill a jar of needles about a quarter full, then pour in olive oil or coconut oil. Put the jar in a double boiler or over a source of low heat. I have used a flat baking pan with water over a warming buffet on low. Let infuse for 3 days, then strain. You can use this in cooking, rub it on sore limbs or drizzle on salads. I tried this with juniper including the berries from my Christmas wreath, but the pectin in the berries added a gelatinous texture- it is still good though. Fill a jar with white pine needles (Douglas fir, balsam pine or spruce will work too.) Fill with apple cider vinegar. Let infuse one month in a dark place. Strain and decant. This works better with apple cider vinegar than red wine vinegar. Fill a jar with a finely cut up organic lemon with peel and pine needles. Pour a thin honey up to the top. Cover and steep for 3 weeks. Strain and decant. This is a delicious syrup which can be used as a beverage, poured over ice cream or used as a cough syrup high in Vitamin C.
If you don’t want to go to the trouble, for medicinal use ask your pharmacist to get you USP Compound White Pine Syrup. It is made of the inner bark rather than the needles, but both work.